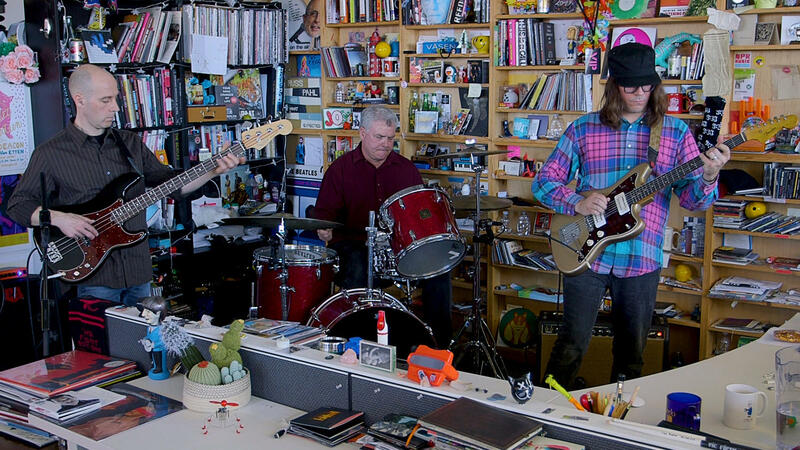 The Messthetics perform a Tiny Desk Concert on April 26, 2018. For me it was exhilarating to see musicians I've known and loved for years be invigorated by younger talent. That's what happened when the bass and drums from D.C.'s pioneering punk band Fugazi crisscrossed with the brilliant, skillful and younger guitarist Anthony Pirog. It's only fitting that this Tiny Desk Concert happened on D.C. turf. I've seen Anthony in a number of settings around town, including the brilliant duo he has with his wife, cellist Janel Leppin called Janel and Anthony. His playing can be understated and over-the-top all at the same time. It never feels self-indulgent and his music always serves the song. Drummer Brendan Canty saw the guitarist perform once and they eventually formed a band. Together, Brendan and bassist Joe Lally are a brilliant pulse of energy and that allows Anthony the freedom to fly. The music they create is like no other. The instrumental music they make is memorable, relatable and transcendent. Producers: Bob Boilen, Morgan Noelle Smith; Creative Director: Bob Boilen; Audio Engineer: Josh Rogosin; Videographers: Morgan Noelle Smith, Beck Harlan; Production Assistant: Stefanie Fernández; Photo: Morgan Noelle Smith/NPR.